Opening Narration: Knight Rider... a shadowy flight into the dangerous world of a man...who does not exist. Michael Knight...a young loner on a crusade to champion the cause of the innocent, the helpless, the powerless, in a world of criminals who operate above the law. "Knight of the Phoenix (1)"
When a young detective is ambushed in a failed police stakeout, he is believed to have been killed. In reality, he revives and learns that his face has been altered and his identity has been changed to Micheal Knight. The man responsible for this is Wilton Knight, a dying billionaire who, convinced that one man can make a difference, has selected Micheal for the role as a crime-fighter. NOTE: Check out the entry in the Internet Movie Database. "Knight of the Phoenix (2)"
Now armed with a advanced prototype car called KITT which has the equivalent armor of a battle tank, capable of speeds over 300 MPH and contains an artificial intelligence computer personality as an aide, Micheal agrees to perform his assigned role. Michael investigates the suspicious traffic death of an Army colonel. He had stumbled onto a scam. KITT navigates a missile test area at great peril. "Good Day at White Rock"
Michael's tranquil vacation is interrupted by a mototcycle gang preparing to do battle with a rival club. "Slammin' Sammy's Stunt Show Spectacular"
Michael joins an auto-daredevil show whose owners unwittingly took out a second mortgage from a crook who arranges "accidents" so he can take over the business. Michael becomes the bodyguard for a crusading state senator who has stepped on one too many toes. "Not A Drop to Drink"
Devon sends Michael to stop a range war over water rights. Devon lands in a small-town lockup on a misdemeanor, but his predicament becomes deadly after a fellow prisoner is killed by the cops. Devon's the only one who knew the man was in jail. Town name is Lindhurst Flats. Michael is assigned to stop KARR, an evil prototype of KITT programmed to survive at all costs--and now on the loose. Michael infiltrates a retired colonel's gang of thieves hoping to catch them red-handed stealing a gold shipment. Memorial to: R.A. Cinder--He was the original. A meek accountant can clear a friend of murder if Michael can find him before he's arrested for "creative" bookkeeping. Michael becomes a student in a driving school for chauffeur-bodyguards to expose an assassin whose targets are a trio of visiting Third World leaders. Michael's only hope of preventing the assassination of a Latin American president is a girl who knows the plan, but has amnesia. Michael infiltrates a ring of gunrunners selling advanced-design rifles in Central America, "Corazon de Piedras". "Give Me Liberty...or Give Me Death"
Someone is sabotaging the cars in an alternative-fuel race, so Michael joins the pack to flush out the saboteur. The murder of a men's magazine publisher leads Michael to Las Vegas and an expose the magazine was about to print. "A Nice, Indecent Little Town"
The trail of a counterfeiter leads to a sleepy little village that not only appears to be harboring the criminal he's after but is also under the eye of the CIA. Michael investigates the mysterious deaths of members of an exclusive club for geniuses, involved in an archaeological dig. Michael tries to prevent a lawyer's assistant from being framed for conspiracy, but there's a complication; she was Michael's fiancee before his identity change. Michael tries to catch hijackers who are knocking off shipments carried by independent truckers. Michael contends with interference from an overzealous private eye while he tries to discover who's stealing computer-software secrets. After Michael unintentionally kills a cycle-gang member, the only witness insists that he recover her kidnapped child before she will help him. Michael and KITT battle a KITT-like truck built by Wilton Knight's ex-wife and son. Michael is planted in a prison to break out an inmate wanted by a terrorist threatening to blow up a city. There's thunder out of the blue when Michael and KITT square off against a futuristic attack helicopter in the hands of mercenaries. Michael investigates a businessman who's exploiting illegal aliens. A blind woman is the only witness. A scuba diver is looking for Aztec sunken treasure. KITT hydroplanes. The boat is the Fin Quest. Michael tries to catch a Robin Hood-style cat burglar before an obsessed cop does. KITT is the bait in Michael's plan to trap customized-car thieves. Suspects found at a traveling custom-car show. Subplot--a couple of inept car thieves try to steal KITT with startling results. A computer whiz cracks KITT's programming and erases the memory, forcing Michael to battle his own car. KITT is 'boxed' for portability in another car. Michael battles to protect Cajun woman from her vengeful husband in a Louisiana bayou. Michael suffers amnesia from a head injury sustained while investigating at a dam and reverts to his former identity as policeman Michael Long. Michael is preparing to attend the Christmas banquet when he encounters a gypsy boy who has witnessed a bank robbery and is sought by the robbers from whom he stole a gold watch. "A Knight in Shining Armor"
A killer with a treasure map must find his victim's estranged daughter, who holds the key to the treasure. "Diamonds Aren't A Girl's Best Friend"
Michael heads for Mexico to trap a talent agent who's using beautiful models to smuggle diamonds into the U.S. Car club members are being blamed for a string of burglaries that coincide with their weekend visits to a coastal community. Subplot--Manny tries to sell a car security system to Michael. Dedicated to the memory of: Marcel Rafael Marcelino who died while his father, Mario, was filming this episode. Michael races the clock to find a gang leader who's the only compatible donor for a girl needing a life-saving transplant. Michael and KITT are put on alert when an anonymous letter warns that a killer may strike at a Foundation sponsored motorcycle race. Seeking revenge against Michael, old nemesis Garthe Knight kidnaps Devon, April and a scientist to force a showdown between KITT and his new and improved GOLIATH. Michael is pursued by an international criminal who knows Michael's former identity and wants revenge. A woman who claims her talking teddy bear toy design has been stolen wants Michael to break in and recover it, is in cahoots. "Mouth of the Snake (1)"
A Government agent, a murdered lawyer's widow and Michael seek connections between an international criminal, a stolen rocket launcher and the code, "Boca Culebra". "Mouth of the Snake (2)"
Posing as a singer in a rock band, Michael looks for the connection between the former lead singer's "accidental" death and an encoded videotape found in his personal effects. While investigating the theft of heavy-duty construction equipment. Michael and KITT are pushed into a quarry and buried with tons of gravel. "Knight of the Drones (1)"
A scientist plans to use robots and drone cars to round up criminals to rob a Federal Reserve Bank. "Knight of the Drones (2)"
Michael trails diamond thieves to the wine country of Northern California where the crooks are using a monastery as a front. "Knight of the Fast Lane"
Michael hopes to flush out a futuristic sports car by challenging its murderous owner to a street race--with KITT as the prize. After Bonnie claims she witnessed a murder, she's plagued by strange happenings designed to scare her out of her new apartment. KITT's evil prototype KARR returns, seeking to destroy Michael and KITT with a new laser stolen from the Foundation. A psychologist who bought a ranch to use as a home for troubled city kids needs Michael's help to stop rustlers and keep angry townsfolk from taking her land. Word gets out when Michael is fired for drug possession, and a crime boss recruits him to steal a one-of-a-kind electronic key from Devon. A young dancer ingests a poison meant for Michael, who races the clock to find the only man with a clue to the antidote. After Michael and KITT are separated in an explosion that erases the car's memory, KITT befriends a boy being chased by thieves who think he can identify them. Michael poses as a mercenary to flush out the Chameleon, a master of disguise who stole a prototype jet pack from the Government to sell on the black market. An extortionist out to sew up the garment industry hires a hit man with a killer car to cut his competition. The "death" of a Thoroughbred racehorse is staged by its owner to cover gambling debts with the money from the black-market sale of the horse. Michael vows to nail the owner of a toxic-waste dump when KITT is nearly destroyed in an acid pit. To catch a saboteur, Michael volunteers to drive an armor-plated limousine during a company's missile-defense demonstration. An international criminal rigs the Government's space weapons headquarters to blow up after construction is completed. Michael enters KITT in a small-town road rally to investigate death threats received by the race's sponsor. A scientist's daughter is kidnapped by criminals as part of a scheme to build a hot new weapon. Michael takes the wheel of a big rig to help independent truckers fight a takeover by a ruthless corporation. Michael poses as a space-weapon scientist to gain access to a club operated by a woman dealing in blackmail and top-secret weapon systems. b: 29 Mar 85 pc: 58642 w: Gerald Sanford d: Roy Campanella Jr.
To find stolen laser rifles, Michael attends a survivalist convention where pistols taken in the same robbery have been sold. Michael and KITT join a circus as a daredevil act to find out who's trying to force it into bankruptcy. "Knight of the Juggernaut (1)"
Michael hopes a street gang can rebuild KITT in time to prevent a criminal mastermind from stealing a radio-active isotope. Meanwhile, Devon is kidnapped and impersonated. "Knight of the Juggernaut (2)"
A group of conspirators trap KITT in an effort to stop Michael. Bonnie's plane is hijacked and the passengers are held hostage by an ex-intelligence agent who wants money and "political" prisoners set free. An archaeologist excavating an ancient burial ground is kidnapped by a man who gets the oil-rich Indian land if no artifacts are found. Bikers hijack the Foundation's truck and use its advanced computers to go on a crime spree. Bonnie poses as a jetsetter to gain access to a foreign embassy planning to ship a canister of deadly bacteria out of the country. Michael races against time to find a stolen hovercraft prototype before a black market arms dealer can ship it out of the country. Someone tries to kill Michael after he qualifies to drive for an independent racing team plagued by a series of "accidents". Michael discovers that prison inmates were used to steal security plans for a hotel that is hosting a defense conference. A childhood friend of RC3's is involved with a blockbusting real-estate developer, who's trying to prevent the opening of a nightclub that could revitalize RC3's old neighborhood. After a near-fatal encounter with a criminal mastermind, Michael falls into a deep depression and wants to quit the Foundation. He and Stevie are married. 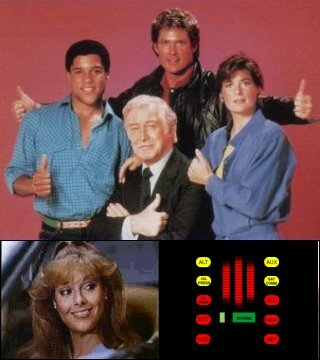 An embittered electronics genius gains control of KITT's programming and turns the car on Michael. A family logging outfit is unable to sell its timber because the local sawmill is buying pirated timber that was out on national park land. Michael suspects a magician of two murders, but the man has a perfect alibi--he was on stage performing at the time. Former heavyweight champ Ken H. Norton plays a battered boxer who comes out of retirement for a fight that could kill him. Jerry Quarry, who was kayoed by Norton in 1975, and promoter Don King have cameos. "Knight of a Thousand Devils"
A murderous mobster is using a dune-buggy race to cover his escape across the border. An arsonist who's setting forest fires to cover a major drug deal eludes Michael by escaping over rugged terrain where KITT can't maneuver. Michael is captured while trying to rescue an American political prisoner held in a country in the throes of a coup d'etat. Inexplicable accidents on a movie set are blamed on a legendary phantom haunting the studio. "Knight of the Rising Sun"
A powerful Japanese businessman attempts to abduct the adopted son of Devon's friend because the boy is a direct descendent of the founder of an ancient terrorist cult. A self-proclaimed voodoo princess is inducing the members of a recently returned archaeological expedition to commit crimes and then kill themselves. The opening narration was not used in the first three episodes. Disclaimer: We have no connection with the show. We are just providing information, which we hope other fans will find useful. Any corrections, updates or other comments about this guide may be sent to: Jeff DeVouge jeffdevouge@auracom.com. Text Copyright © 2000-2003, Jeff DeVouge. All rights reserved.